Rosalind is still with me. She is, almost always, in the house in the morning. Carole and Larry saw her when they were here. 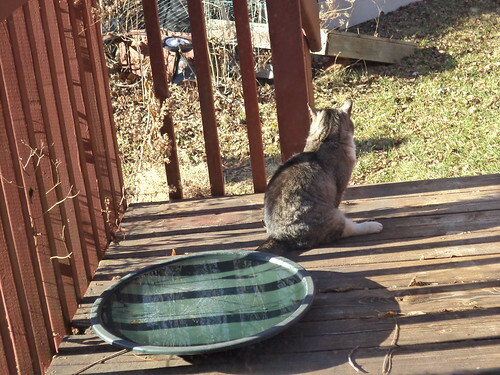 If the weather is above freezing, she comes out and sits patiently by the house, waiting for me to bring out her food. She still runs but she does pause to see if I am coming out of the house. On Tuesday morning, I got a 'meow' before she headed under the deck. The weather last week was downright balmy for the end of December. That lead to the birdbath being in liquid, not solid, form. 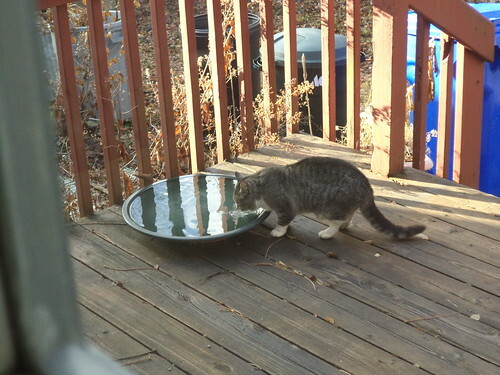 I watched as she finished some of her food and then went to the birdbath to drink, eschewing the water which was in the other side of the dish. I had cleaned the birdbath about a week before, to remove the last vestiges of fall debris. Maybe it tastes better? Because the day was in the 50's, she lounged on the deck, surveying the back yard. I can't decide if the way she's sitting is indicative of a problem or if that's just how she sits. Neither Mija nor Pilchard sit like this. She does scurry away off the deck effortlessly and I've seen no sign of a limp. But, this is yet another reason to gain her trust, so I can have this checked out. And then there was this on New Year's Eve. I was allowed to leave early and, after I got home, I came into the kitchen to take some photos and there was this face at the door. I slowly approached the back door. She stood there for a minute or two before going to her left, through the slats to the ground and under the deck. She was right back in the morning. On New Year's Day, which was clear and gloriously sunny, she was lying across the threshold in front of the back door. She moved when I tried to take a photo. Am I slowly, slowly getting her to understand that I care and I only want what's best for her? We are to get rain and then snow this weekend. I will worry about her. I know the house is warm and dry and her food and water will be placed inside the house so she can eat where it's dry. Then the temperatures plummet and I'll worry about her even more, that she's staying warm. I wish there was something else I could do so she would trust me to bring her inside where she would be warm, well fed and know love. Tree House Animal Clinic says she will be okay because she's using the house and I'm feeding her. They think she could get over her fear by spring. 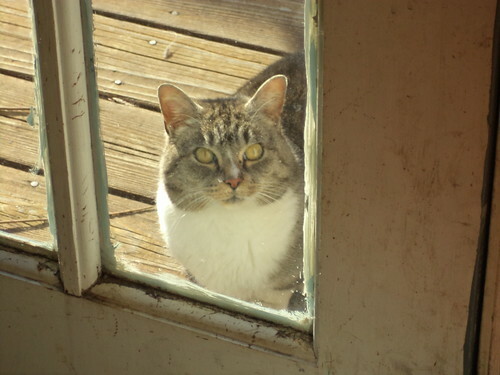 Of course I don't want to wait that long and I know the issues bringing her inside will cause with Mija and Pilchard, Pilchard in particular, but it bothers me that she's outside in the cold. I just need to trust that I'm doing all the right things. She's such a pretty kitty and deserves love as much as my indoor girls do. Argyle and Stripes and Ornaments, Oh My!